China's aggressive environmental protection campaign has tightened supplies of graphite electrode. Nearly 300,000 tonnes of graphite electrode manufacturing capacity has been shut since the second half of 2016, creating a global shortage and lifting prices by over 300% since January 2017. Presently prevailing volatility has made the market fairly unpredictable leaving trade participants exposed to the possibility of violent fluctuations. Experts from world over have been minutely following updates in the industry to foresee even the slightest variations that could disturb up the delicate trade balance. 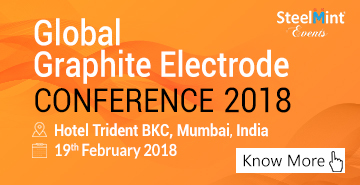 SteelMint's one day Global Graphite Electrode Conference will address the future demand/supply scenario of Graphite Electrode in 2018, in the context of sky-rocketing prices in the last year, uncertainties surrounding needle coke supply, how China will regulate the global markets, and an assessment of the challenges faced by the Indian buyers. SUFI is a federation representing all the stake holders in steel space such as steel mills, steel users, steel traders, steel brokers and steel service providers across INDIA. The fundamental objective of SUFI is to bring all the stake holders onto a common platform so that all can move forward in a tandem in order to achieve the targets as set in current steel policy by ministry of steel. These targets can only be achieved by continuous dialogue amongst the stake holders and jointly with the government on policy issues. The need of the hour is to create awareness amongst steel fraternity regarding new applications of steel, introduction of new qualities and new research and developments. These are only possible through seminars and conferences. SUFI is proud to be associated with STEELGROUP in order to organise various summits, conferences and seminars so that these objectives are met. Automobiles form a very and important constituent in steel consumption. 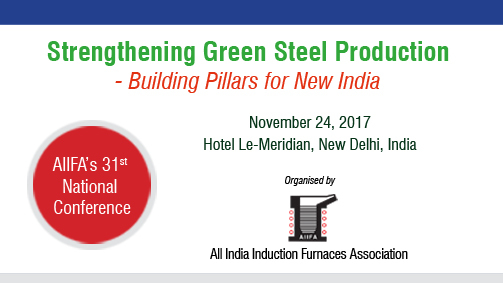 AIIFA's 31st National Conference has been designed under the pertinent theme of "Strengthening Green Steel Production: Building Pillars for New India". The strong efforts made by the organizers aim at bringing the entire secondary steel sector under a common umbrella; making consolidated efforts to solve the sectoral issues; strengthening the sectoral presence and importance and building foundations for a sustainable future. With its crude steel production reaching over 100 Million tonnes (MT); India stands high in the global steel market with an ambitious target of the government on producing 300 Million tonnes (MT) by 2030. Amidst the lucrative national figures and rising importance of India in the global steel industry, environment of the steel sector remains a fact. The reasons for such volatile conditions of the steel sector can be cited to a number of factors like demand deficiency, decline of trade competitiveness and surge in imports, financial fragility, excessive taxation, low availability of skilled manpower, among others. The future of secondary steel manufacturing especially the small and medium enterprises can be bleak; unless the entire fraternity comes together and face the road-blocks under joint efforts. The 31st national conference organized by AIIFA is one such opportunity for the entire secondary steel fraternity to come and display our strengths and build foundation for a sustainable future. Chamber of Industrial and Commercial Undertaking (CICU) is a leading Industry Chamber of India ever since 1968 and it is recognized by the Govt. of India, Ministry of Commerce & Industry for dealing with the development & regulation of Imports & Exports. It has been an active participant in the India Growth Story through its advocacy role for the Policy Makers and regulators of the Country as a true representative of the Industry. CICU has forged ahead leveraging its legacy with the Industry knowledge across sectors. At a Global level the Chamber has been working with the Embassies and High Commissions in India to bring in the International Best Practices and Business Opportunities, Industrial Development, Health, Education & Skill development, Infrastructure, and Digital India are the key thrust areas of the Chamber.. We are glad to inform your good-self that CICU is conducting 4th International Engineering & Technology Sourcing Show (IETSS) from 25th to 28th November� 2016, at Glada Ground, Opp. Vardhman Mill, Chandigarh road, Ludhiana (Punjab). The exhibition will have participation of over 300 exhibitors and more than 40000 visitors from various industries across the Indian and Foreign countries. 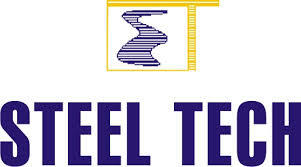 Steel Tech has made this International Seminar in Kolkata an Annual Event that has been extremely well received by all those who participate owing to its business-like approach. 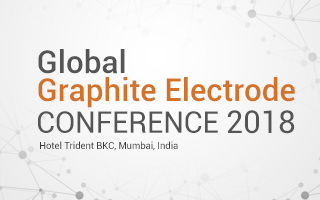 The earlier Seminars, starting from 2009, covered subjects like �Alternative Routes for Ironmaking in India�, �Ironmaking in Blast Furnaces�, �Steelmaking Technology in India� and �Innovative Technologies for Clean, Green & Automated Steel Plants : A Better Tomorrow� , which attracted a large number of Indian and global participants In order to survive amidst challenges from cheap imports, it is imperative for the Indian steel industry to reduce cost of production by adopting suitable technologies and benchmarking their operations This has led us to set the focus of this year�s International Seminar to be �Technologies for Making Iron & Steel at Competitive Costs: Benchmarking Operational Parameters� where technology suppliers from across theworld and Indian steel producers� both from primary and secondary sectors can participate and deliberate. 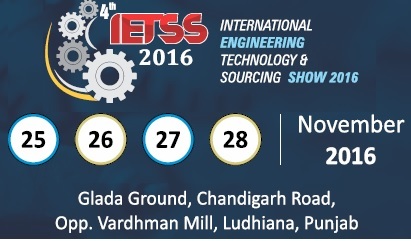 World of Industry INDIA (WIN) 2015, in its 9th edition, will be demonstrating complete range of products and services, from Hydraulics and Pneumatics to Electro-Mechanical Transmission, automation components to process and factory automation systems, materials handling equipments to logistics infrastructure systems. SteelFab, the region�s premier metal working, metal manufacturing and steel fabrication trade show, has succeeded in taking advantage of a growing economy and the euphoria surrounding the winning bid to host the World Expo 2020 in Dubai, UAE. So it came as no surprise when SteelFab 2014 achieved phenomenal growth, adding 50 per cent more exhibition space to accommodate a 25 per cent rise in the number of exhibitors. The increase in visitor turnout too saw a significant surge of 25 per cent, an unprecedented rise in the 10-year history of SteelFab. This overall growth is seen as a clear indication of a booming market, and SteelFab 2015 is offering you an opportunity to be part of this exciting growth story. As you are aware, India�s steel industry is poised to grow significantly in the next few years�from the present 85 Mtpa to 300 Mtpa by 2025. How this can be achieved? Iron and steel need to be produced at the most competitive costs for remaining sustainable and compete with China and others, not only in the country but also globally. India is endowed with rich reserves of iron ore and non-coking coal. Global leaders in technology and equipment will showcase how to use indigenous iron ore fines and coal for production of steel at lowest cost and still achieve the best quality. The 6th International Seminar by Steel Tech which is acknowledged as one of the best arranged seminar in contents and participation will offer the perfect opportunity to analyse what factors will shape India's iron and steel industry in the current decade. Find out how you can develop critical business strategies to put you at the forefront of this dynamic steel market. MMMM 2014 is a leading trade platform for Minerals, Metals, Metallurgy and Materials industry. This business exhibition now in its 10th Edition is a biennial event and has been well recognized by the industry in India as well as world over for product showcasing and branding. MMMM has over the years become a fixed entry point in the diary of industry professionals associated with Minerals, Metals, Metallurgy, Materials and the allied sectors. The buyers are mainly from North America, West Europe, Japan, Korea, as well as domestic manufacturers requiring large procurement, etc. Most of the suppliers have their own factories in China mainland. At the request of buyers, SC will invite appropriate suppliers or assigned suppliers, and assist buyers forming business partnerships with suppliers before the conference. All the information on suppliers and buyers will be strictly examined by SC. Purchase discussion, purchase explanation and the products promotion conference will help facilitate an understanding between buyers and suppliers, the goal of the trade agreement will then be realized. Organiser: Messe Dusseldorf India Pvt. Ltd. The Indian mining sector plays a pivotal role in the country's infrastructure and economy. Globally, India ranks 2nd in Chromite, 3rd in Coal & Lignite and Bauxite, 4th in Iron ore and 5th in Manganese. The future of the mining sector lies in laying emphasis on scientific mining so that state of the art technology is used for exploration, efficiencies are realized, clean technologies and safe mining practices are adopted with adequate supporting infrastructure. India was estimated to have spent $14 billion on coal imports last fiscal year and that figure is likely to rise to $25 billion by 2016/17. This combined with factors like the widening Current Account Deficit, depreciation of the Indian currency , and need for enhancing infrastructure for bringing back growth in the economy has made sure that the Government has introduced a slew of measures to facilitate / enhance mining in India. These are Easing environmental clearance norms for expanding coal mines to help the crippling fuel scarcity in the power sector. Coal blocks auction Cabinet Committee on Investment to fast track project clearances. Inviting Private sector participation in Coal India Limited for developing 13 greenfield projects with a 65 million tonne annual capacity. Sponge iron is a crucial part of the Indian Steel industry. With an installed capacity of about 45 MnT, India is the largest DRI producer in the world. There are almost 400+ plants registered. Things have not been good for the industry for last few years due to mining ban, restricted supply of Iron ore, logistical issues & Coal linkages. But as they say, every commodity has a life cycle. Experts believe that the rough patch is over. Things will change for the industry on factors like evolution of Pellets, increase in Coal imports, expiring WIS rakes & technical changes. 2014-2015 looks good for the industry for various reasons. Let us join together and discuss the possible opportunities ahead. Celebrating its 10th anniversary, Platts Steel Markets Europe conference will once again debate all that matters for today’s steel producers, traders, distributors and end users. Taking place in the industrial heartland of Germany, and backed with even more high-level steel producer speakers, 2014’s agenda will focus on the key factors preventing the European steel industry from making a substantial recovery. Metal & Steel Saudi Arabia is positioned as the leading B2B gathering in the Gulf region for steel, steel fabrication and metallurgy industry: Putting Gulf and Saudi Arabia under the microscope, Right from the outset. It has firmly established itself as a solid platform for industry professionals in the region and a must-attend show for manufacturers, distributors, decision makers and contractors, etc. A bright future lies ahead for Metal & steel Saudi Arabia Exhibition which, following the success of the 2012 show, the 2014 edition is set to be the best one yet. Enjoying the continuing endorsement, support and sponsorship who recognize the importance of this industry and its positive impact on the KSA economy. With constantly growing demand for iron, steel and various metal, it is of vital importance to help plant owners and operators to achieve high productivity, high quality, flexible operation and cut costs by providing a comprehensive platform for high tech machines, innovations, software and solutions, serving this wealthy market and new investments. 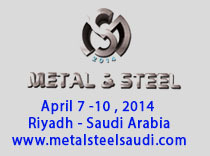 Metal & Steel Saudi Arabia 2014 presents exhibitors with an outstanding opportunity to meet new and existing customers, launch new products and benefit from on-site sales, plenty of sales leads and brand visibility. It delivers an excellent return on investment for exhibitors and a first-rate event for visitors. Step up your business with Metal & Steel 2014; New SALES LEADS come pouring in! BOOK YOUR STAND TODAY! Organiser: Arabian German Exhibitions Ltd.
Metal & Steel Middle East Exhibition, has firmly proved itself as the foremost exhibition for Steel, Steel Fabrication, Foundry and Metal works professionals in the Middle East & Africa (MENA), now in its 8th edition and continues to expand and attract thousands of potential visitors, and this year's event will confirm firmly to provide the only “one-stop” steel event in the entire Middle East, backed by media with a long term commitment to the region, and not just a “here today, gone tomorrow” approach. The Regional steel industry is taking up the direction of reinforcing its strength and the new governments provide important opportunities for economic reform towards development of core infrastructure. It forecast a 20% gradually increase in business from this sector in 2015 versus 2011, due to the stable political situation in the MENA region. 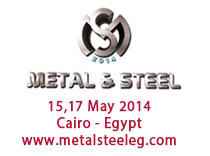 The show brings together the world’s leading manufacturers and suppliers of steel and metal industry. Many of the main stream players have recognized the potential projects within the Middle East. They are committed to the Middle East, and have used Metal & Steel Middle East 2014 as an integral part of their marketing push in the region. Venue: China International Exhibition Center, Beijing. With a history of over 20 years Metal + Metallurgy China has been regarded as the largest exhibition in the hot metal processing industry in Asia and the second largest in the world by providing a professional platform for Chinese and overseas companies to meet clients, as well as to keep competitive in the market. The 2012 edition, covering 8 exhibition halls of 106,000 square meters in total, successfully attracts 1,375 exhibitors and 86,440 visitors from 74 countries/regions. It’s also been widely supported by the industry associations from Europe, Italy, Germany, Spain, USA, Belgium, Japan, and Taiwan Region. The global network ensures the exhibition’s leading position in the world. Apart from the exhibition itself, a series of academic symposiums and seminars will be organized concurrently for the participants to learn and discuss the hot topics, like the latest policies, the development prospects, the emission reduction and the energy saving. Returning for its 18th year, Metal Bulletin Events’ Galvanizing and Coil Coating Conference will be hosted in the European hub of Munich. Featuring a panel of expert speakers from across the supply chain and unrivalled networking opportunities this event is not to be missed. 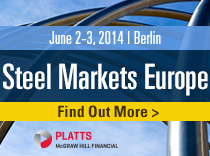 · Market fundamentals for galvanized and coated steel globally - where is the industry headed? The 4th Annual Metals Trading Operations & Technology 2013 Summit is designed to bring together key players of the metals sector, including physical and financial trading companies, metals trading investment firms, warehouses and regulators. These key industry players will participate in this senior level platform to address the latest developments in terms of regulations, risk management, technology and operations challenges in the metals trading landscape. The presentations, panel discussions, workshops and also cocktail reception and private gala dinner will provide you with opportunities to discuss, debate, question and analyse challenges and solutions to operational and technological issues impacting the metals trading industry. Make sure you register early to be there!